Taking good care of your mouth and teeth throughout your whole life can help prevent problems as you get older. Taking care of your teeth means brushing and flossing every day and seeing the dentist regularly. A healthy mouth is more important than you might think. Consider everything you expect your mouth to do each day. You use your mouth to eat, to smile, to speak, and more. Poor oral health can affect any or all of these things. Good oral health isn’t hard to achieve but it does take discipline. Use these tips for a lifetime of taking care of your mouth and teeth. The first set of teeth is already almost completely formed at birth. At first, these teeth are “hiding” under the gums. These teeth are important, because after they come in, they let your baby chew food and talk well. You baby’s first set of teeth also holds the space where permanent teeth will eventually be. They help permanent teeth grow in straight. Clean your baby’s new teeth every day. When the teeth first come in, clean them by rubbing them gently with a clean wet washcloth. When the teeth are bigger, use a child’s toothbrush. Children under 2 years of age shouldn’t use toothpaste. Instead, use water to brush your child’s teeth. Encourage older children to eat low-sugar snacks, such as fruits, cheese, and vegetables. Avoid giving your child sticky, chewy candy. 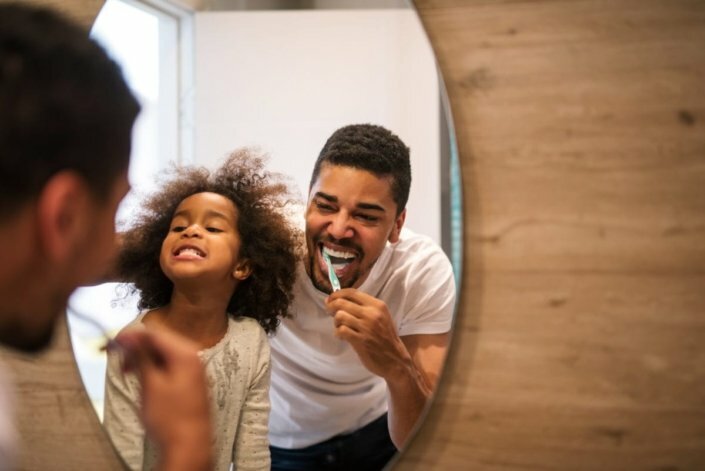 Teach your children how to brush their teeth properly and the importance of keeping their teeth clean. Take your children to the dentist regularly. The American Dental Association recommends that children see their dentist starting at 1 year of age. Brush your teeth at least twice a day with a fluoride toothpaste. Don’t smoke or chew tobacco, which can stain your teeth, give you bad breath, and cause cancer. Wear the right protective headgear while playing contact sports. See your dentist every 6 months for regular check-ups and cleanings. Continuing good mouth and tooth care as an adult can help you avoid tooth loss, painful gums, or other problems. If you have any problems with your teeth or concerns about your mouth, see your doctor or dentist right away. Don’t smoke or chew tobacco. Look inside your mouth regularly for sores that don’t heal, irritated gums, or other changes. Cavities. Cavities are caused by tooth decay. Your teeth can decay when you do not brush and floss them regularly to get leftover food off of them. If left untreated, cavities can tooth pain, can cause your tooth to become infected, and can even lead to tooth loss. Gum disease. Plaque on your teeth can lead to gum disease. Gum disease is an infection of the tissue that supports your teeth. It can cause teeth to become loose over time. There is also evidence that gum disease is related to heart disease. Experts aren’t sure if gum disease makes you more likely to have heart disease or vice versa. Oral cancer. Smoking, chewing tobacco, and alcohol can increase your risk for oral cancer (cancer in your mouth). Poor oral hygiene alone may not increase your risk for oral cancer. When you combine it with any other risk factor, though, it dramatically boosts your chances of getting cancer. Poor self-esteem. When your teeth aren’t clean, you have bad breath. Bad breath can make you feel uncomfortable at work, school, and in social situations. This can make you reluctant to participate. Longtime poor oral health can result in tooth loss, which can make you smile less. All of these things can damage your self-esteem, or how you see yourself. If you have mouth or tooth pain, do not ignore it. See a doctor or a dentist. The longer you wait, the worse it could be for your mouth. You should also see your dentist twice a year to get your teeth cleaned. If your dentist diagnoses you with gum disease, share this diagnosis with your medical doctor. Can my diet affect my oral health? Is one toothpaste better than another? Am I brushing my teeth the right way? Is it safe to have a root canal? Should I get denture or a dental implant?